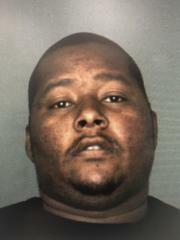 Karl Porter arrested for armed robbery & assault w/a deadly weapon. DATE/TIME: December 14, 2018 / 4:11 p.m.
On December 5, 2018, at approximately 2:15 pm, an armed robbery report was reported by a victim near the intersection of 6th Street and Cooley Street, San Bernardino. The victim reported being robbed at gunpoint by a large black male, in a red car being driven by a black female. At approximately 2:00 pm there was an incident at a nearby business regarding a large black male that was in possession of a firearm. Deputy B. Ortiz, from the Sheriff's Central Station Detectives Unit, responded to the call and investigated the robbery. Ortiz gathered information which led to a vehicle description and suspect leads. On December 14, 2018, at approximately, 4:11 pm, Dep. M. Moreno, from Central Station, observed the vehicle used in the robberies and conducted a traffic stop. Moreno contacted the driver and identified him as Karl Rico Porter. Moreno also located a replica firearm matching the one used at the scene of the crime along with a large amount of cash. Deputies determined that Porter was the person that committed the robbery. Investigators are still attempting to identify the red sedan and the black female driver of this suspect vehicle. Porter was arrested and booked into the Central Detention Center. Porter subsequently bailed out and is currently free on bail. Investigators believe Porter and the unknown female accomplice may have committed other robberies and are asking for the publics assistance in developing leads. We urge the public to report suspicious activity. Witnesses and victims of crime can call Central Station at (909) 387-3545. Callers who want to remain anonymous can call the We-Tip Hotline at 1-800-78-CRIME(27463), or they can use www.wetip.com.